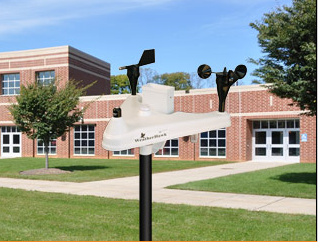 PRECONFIGURED - Al-Worod Al-Dania ES Co.
Pre-Configured Weather Station from WeatherHawk. WeatherHawk, a division of Campbell Scientific, Inc., which is responsible for the sales and support of the WeatherHawk family of personal weather stations. WeatherHawk is used by universities, schools, government agencies, agriculture, industry, homeowners, resorts, and consumers in a wide variety of applications. Pre-Configured Weather Station with solar panel for charging. These stations are designed for applications where a minimal visual impact, high reliability, and a long interval between routine servicing are significant factors in the decision to purchase. § Direct connection to PC through RS232 I/O. § Spread spectrum RF transceiver. § IP server module. Output formats from the IP server module are HTML, XML and CSV (with headers). Ø Visual Weather Station – a single host, multi-site professional application that will communicate with the weather station, as well as CR200 Series data loggers from Campbell Scientific, Inc. Visual Weather Station adapts to any data telemetry scheme including direct connection, wireless short haul RF (spread spectrum radio), wireless long-haul RF (VHF/UHF radio), satellite modem, IP modem/server module, or landline and cellular modems. Ø XP/X – a single host, single site consumer application that will communicate with any weather station. The XP/X connects using a directly to the serial port on the station, or by wireless short haul RF (spread spectrum radio), or IP modem/server module, or landline and cellular modems. Ø Virtual Weather Station – a single host, single site consumer application that will communicate with any weather station. Ø LoggerNet – a single host, multi-site professional application that will communicate with any weather station, as well as any data loggers from Campbell Scientific, Inc. LoggerNet adapts to any data telemetry scheme including direct connection, wireless short haul RF (spread spectrum radio), wireless long-haul RF (VHF/UHF radio), satellite modem, IP modem/server module, or landline and cellular modems. Ø PConnect – a single host, single site professional application that will communicate with any weather station, as well as a range of Campbell Scientific data loggers. PConnect is used for direct download and storage of data through the serial port on either the weather station or its companion RF4xx receiver (if wireless). The software is typically utilized for field data acquisition with later export to a PC for post-processing, display and long-term archiving. It also enables on-site reprogramming of the weather station by uploading pre-configured program files. It is not designed for long haul or automated data collection protocols. https://www.campbellsci.com/et107 for evapotranspiration ET system. https://www.campbellsci.com/raws-f for fire weather alarm system. http://www.weatherhawk.com/weather-stations for home automation; education; emergency management systems.